← Prick in the Papers! And so Tuesday night turned into an impromptu date night, with Mr and Mrs Prick ducking across to Annandale to check out the new Sede restaurant which has just opened up in the old Vicini space on Booth Street. That’s Sede, pronounced seh-DAY, by the way, not “seed”: Think somewhere between seedy and the singer Sade. Say “sedate” and drop the “t” and you’re almost there. It’s Italian, and our waitress told us she thought it meant “venue”, though our friend the Vodka Mogul tells us it’s actually a form of the verb sedere, “to sit”. Anyway. Downstairs at Sede. It’s small. It’s a bar. It’s a small bar! Sede is at least two, and quite possibly three, restaurants in one. 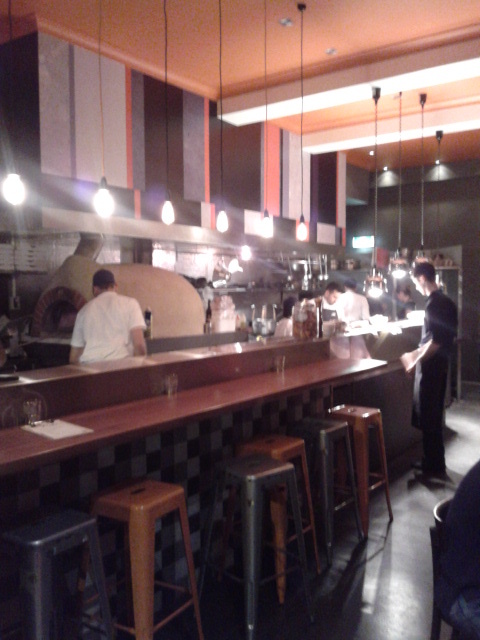 Sitting in an old corner terrace/shop building, the downstairs is gourmet pizza and wine bar snacks with a proper pizza oven blasting away behind the bar. Upstairs is a more refined, modern bistro: warm, soft, colours, a lovely timber ceiling, a couple of big modern canvasses on the walls, with tables also set out on the balcony to watch the passing parade of hipsters and yummy mummies and Audi Q7s as they glide around the roundabout. While downstairs is decidedly Italian, the upstairs menu only hints at these roots: a bit of pancetta on some quail over here, a bowl of linguini over there. 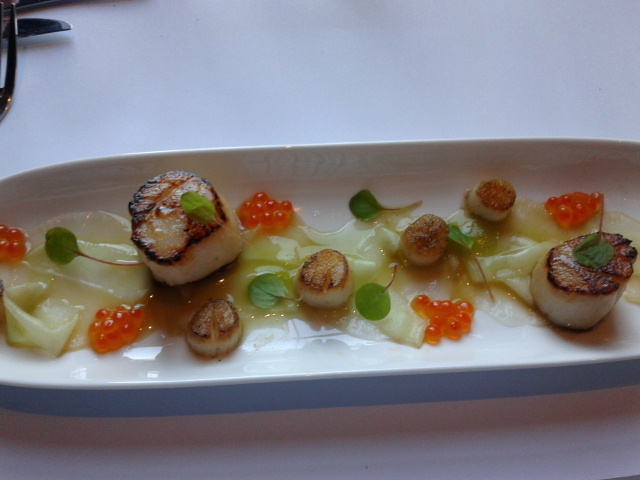 Now the Prick can never go past scallops, and so was tempted into trying the “seared Canadian and popcorn scallops, textures of cucumber, pickled daikon, apple, salmon roe”. The concept of the dish is great, with the big and little scallops – “sea” and “bay” scallops as we call them back home – tied together with what sound like some pretty natural accompaniments. The presentation was very attractive and thoughtful. Sadly, the dish was let down by overcooked scallops – especially the “popcorn” numbers, which had been left searing on the heat for far too long – and there wasn’t enough differentiation between the cucumber(s), daikon, and apple. This could be a good to great dish, but it needs some refinement. As well, what’s with the “Canadian” designation for the scallops? Again, huge potential here, but at the moment more “meh” than “eh?”. It should be said that the kitchen did nail it with Mrs Prick’s salt cod-stuffed zucchini flowers, which weren’t particularly fancy but which hit the brief perfectly. Now the Pricks are both salt cod brandade connoisseurs (hey, everyone needs a hobby, right?) and this was almost as good as it gets. Special mention to the caponata as well, which both packed a lot of flavour and avoided being oily. On to mains, and here the Prick did something he never, ever does, namely, went the vegetarian option. But there can be a first time for everything. And just as it is sometimes tempting to vote for the Greens in the Council elections because for all their nuttiness they do a good job of keeping local populations down and property prices up, it is also hard to go past a menu offering like “pan-seared potato and spinach gnocchi, tokay-steeped sultanas, pine nuts, crisp sage, burnt butter, and truffle pecorino”. The Prick succumbed, and was glad he did. Vegetarian is no longer a super-dirty word at Stately Prick Manor. Seriously, vegetarians, VegeTARAians, and vegulons alike: if you want to win converts to your cause, this is how you do it. 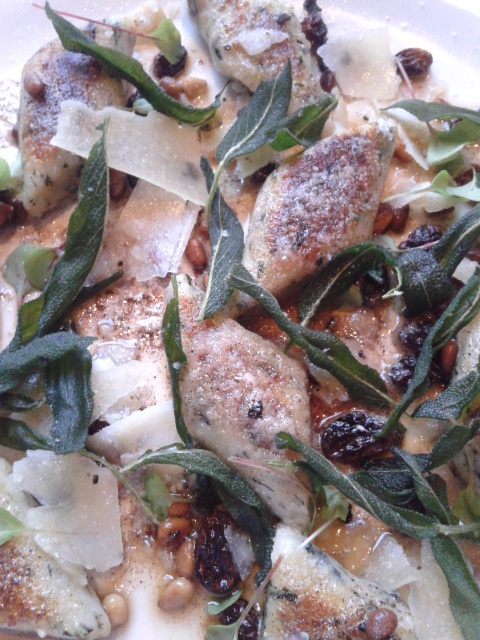 Elegantly presented, the contrast between the sultanas (great idea with the tokay) and the pine nuts and the sage from the restaurant’s own little kitchen garden, a helluva good burnt butter, light, pillowy gnocchi (though too big – one should never have to use a knife with gnocchi), shavings of cheese, it fired on all cylinders. This was the first time in years the Prick had finished a main that didn’t involve meat without feeling like we’d lost a war. Yet sadly, in the swings and roundabouts of eating out, it was Mrs Prick’s turn to experience a touch of menu envy: Her pork belly was good, but not quite as melting and unctuous as she would have liked, and the polenta was a bit grainy. If the scallops seemed a bit over-engineered for the dish’s own good, the pork just needed a bit of tarting up. Nevertheless it is clear that Sede is already hitting the mark in a suburb that is quickly becoming Woollahra West. Annandale is becoming a bit of a hub for this sort of relaxed but classy fare (the lovely Booth Street Bistro being the local ground-breaker, of course). On the Pricks’ Tuesday night, normally doldrums for the trade, Sede was doing probably twenty covers upstairs and a good business down, consisting of a mix of families and locals of both the trendy and establishment variety. One fellow who looked like something out of the Bondi Hipsters had brought his new girlfriend along to meet a swag of his WASPy elderly relatives and it wasn’t clear who were the locals and who, if any of them, had come over from the East; it was a bit awkward but happily for everyone concerned they discovered they all liked dogs, which provided safe space for conversation (“Yeah, I’ve got a friend? She’s got a Labrador? And … yeah.”). While there were a couple of missed notes, the Pricks understand that Chef’s wife has just had a baby which has him off doing the home front thing for a little bit (would a chef use an immersion circulator and water bath to warm bottles to precisely the right temperature? The Prick would). This leaves his number two in charge which, along with the newness of the format, makes such teething wobbles forgivable. (And in number two’s defence, he straight-up took the pineapple curd tart off the menu when he couldn’t get the sugar balance right – a bit of honesty that deserves kudos.) The upstairs-downstairs format seems to work, though would be nice to see some of the small bar offerings upstairs and vice versa. The Pricks might well have had a bit of that chicken liver pate to start, but alas it’s only served at the bar; likewise, a bottle of chilled white and plates of those zucchini flowers would be a lovely early evening snack downstairs. Still, Annandale and surrounds is clearly the sort of market that can sustain this sort of thing, and Sede is a welcome thing to have in the near-ish by. Verdict: The Pricks shall return. Looks good. 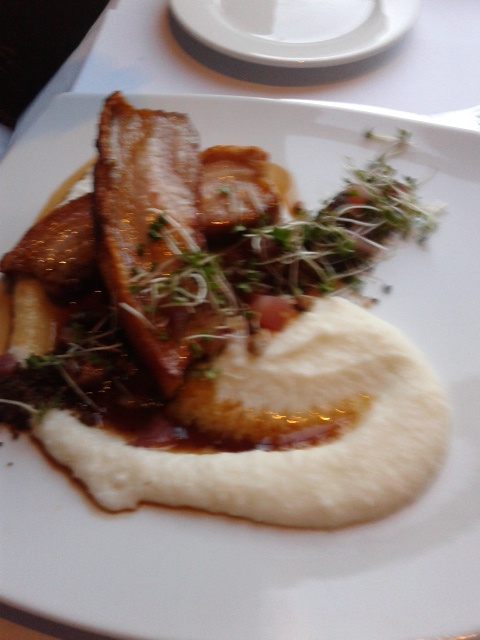 The Drs Duck had a pretty ordinary meal at the Welcome Hotel in Rozelle on Sunday, just because it was convenient. Place does not quite know what it is, and I can’t understand why the online reviews are so positive. It looks like we should have gone down the road to Annandale. 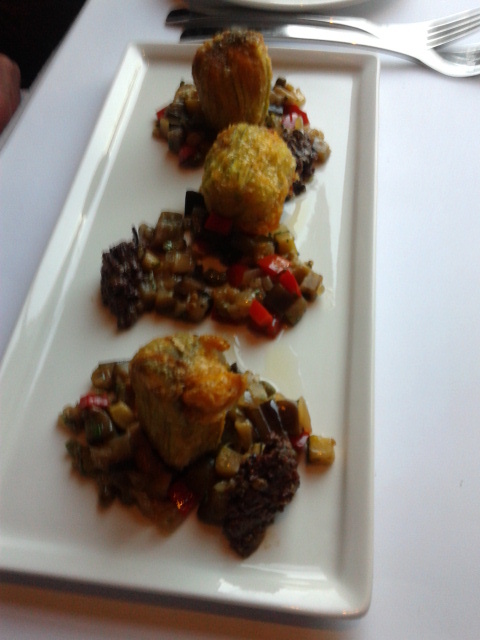 Those salt cod stuffed zucchini flowers look particularly good. Thanks for the tip, Mr Prick. I saw that place while driving past and wondered if it was any good. If you have seen the movie where Marcello Mastroianni and friends eat themselves to death, you might wonder about the wisdom of calling a restaurant after it. Still, the menu at La Grande Bouffe looks much better than what was on offer at The Welcome Hotel. I’ll certainly give it a go at the next opportunity. Thanks for the mention! I love gnocchi. It’s always great to hear about restaurants with decent vego dishes.